Actress and world famous fashionista SONAM KAPOOR has just added another feather to her cap. She played showstopper for RALPH AND RUSSO at the very prestigious PARIS COUTURE WEEK! Her showstopper outfit will take your breath and heart away. So hold your breath and see it for yourself! I am speechless! Sonam looked like a Goddess on Earth dressed in this dreamy and absolutely stunning Ralph and Russo Couture. This Autumn/Winter 17-18 bridal gown set in ivory hues with a lot of shimmer transports you to the world of luxury and glamour. You cannot take your eyes off this mesmerizing ensemble even for a second. That long ruffled train is unarguably charming and the sheer veil adds a gothic touch to the look. The gown is encrusted with diamonds which is why the whole ensemble makes for such a royal picture. Sonam pulls off every ensemble with panache and attitude and this is no exception. She walked the ramp not as a showstopper but as a Goddess who has just arrived on the planet. The look was accessorized in tune with this amazingly embellished creation. Sonam’s eyes were given a dash of silver which looked enchanting and glamorous. I am here to share the press release of renowned designer ANITA DONGRE’s show at the prestigious LAKME FASHION WEEK SR’16. I would like to thank ELEVATE PROMOTIONS for sharing the press release with me. Day 3 at Lakme Fashion Week concluded on a transcendent note as Anita Dongre unfolded a whirlpool of emotions weaved by tradition and grace in her Spring-Summer 2016 collection – Love Notes. Heralding the arrival of summer, the designer captures the poignant emotion of love told through the musings of a young woman who is exploring the changes her lover is likely to bring in her life. The show transported the audience to a world of fantasy with the entrancing aura of carmine pink and cyan green foliage. Bougainvillea stems rose up to the sky exuding soft sophistication infused with flair. Personifying the opulence and magnificence of the land of royalty- Rajasthan, the stage reflected the grandeur of an imperial Rajasthani palace. Industry stalwarts including SWARA BHASKAR, MINI MATHUR, MIRA RAJPUT, ISHA KOPPIKAR, TIMMY NARANG, SANJAY SURI, POONAM SINHA, SANGEETA BIJLANI, MARIA GORETTI and TANNISHTHA CHATTERJEE extended their support to the designer. The ramp was illuminated with the vivacious hues of hot pinks, sage green and candy yellow and featuring the designer’s signature gota-patti and resham embroidery. Each ensemble tells its own quiet love story capturing this poignant emotion in ethereal tales. The audience were left mesmerized as Sonakshi Sinha walked down the runway playing the perfect muse, portraying a young princess full of emotions, passion and grace. Autocratic romanticism of the urban Indian woman was witnessed as Love married elements of international appeal with a traditional Indian aesthetic. A melange of functionality and fantasy, the collection is designed to resonate with the modern Indian woman- strong but feminine, opulent yet effortlessly graceful. A love to last the ages, the collection is a testament to the everlasting amorous feeling of love. Presenting to you a press release of fashion designer SWATI VIJAIVARGIE’s show at the ongoing LAKME FASHION WEEK SUMMER/RESORT 2016. I would like to thank Elevate Promotions for sharing the press release with me . 31st March, Mumbai: It’s that time of the year again where we get to see India’s best designers, celebrities and fashion enthusiasts come together to celebrate Indian fashion at its finest. A veteran in the fashion circuits, designer Swati Vijaivargie unveiled her collection ‘Bagh’ at the Lakme Fashion Weekheld at the St. Regis Hotel today. Actresses like Rasika Duggal, Nauheed Cyrusi, Nushrat Bharucha, Mansi Scott & Shonali Nagrani embraced the occasion wearing Swati’s outfits and lent their support to the designer. The beautiful SOHA ALI KHAN walked the ramp for famous designer JJ VALAYA at the BLENDERS PRIDE FASHION TOUR. The creation, which is intricately embroidered is reminiscent of the royal era of the Kings and the Queens. It speaks of magnificence, luxury and grandeur. 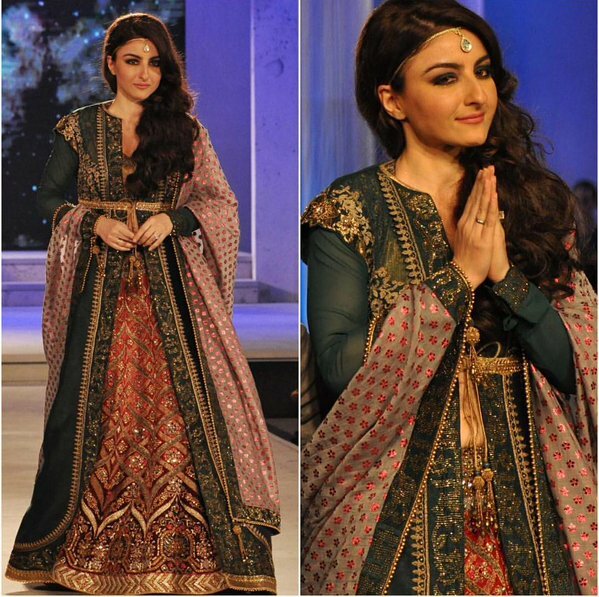 Soha was an apt choice as the showstopper. The makeup was kept soft so that the dress enjoys all the attention. 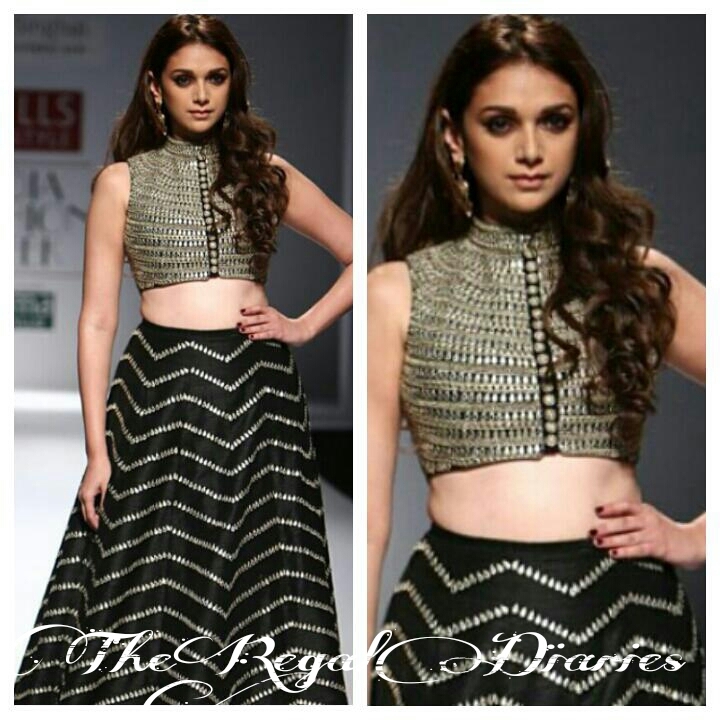 Absolutely gorgeous Aditi Rao Hydari walked for Payal Singhal at the ongoing Wills India Fashion Week. The outfit speaks of simplicity and elegance. The show was put up nicely! Sushmita Sen ruled the ramp when she walked for Sonaakshi Raaj at the India Bullion Jewellery Week. Sushmita spells sheer grace and royalty in this dazzling outfit. Diana Penty closed the show for Elle French Fashion Wear at the Myntra Fashion Weekend. The outfit is chic and elegant and accentuates Diana’s stylish appeal.